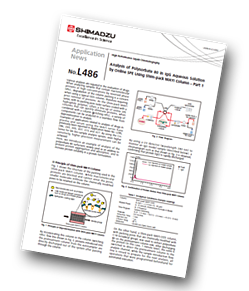 Shimadzu has produced an application note demonstrating how the analysis of polysorbate 80 in IgG aqueous solution is simplified using an online-SPE system. Biopharmaceutical products require surfactants to keep proteins stably solubilized, and polysorbate 80 is commonly used for this purpose. This necessitates determination of polysorbate 80 concentration in the final product. Since direct analysis of high concentration protein solution causes analytical difficulties, sample pretreatment is needed to remove proteins and enable analysis of polysorbate 80. In this application a system that incorporates the deproteination step for accurate quantitation of polysorbate 80 by online-SPE using Shim-pack MAYI-ODS is described. This special trap column was developed for efficient binding of low molecular weight substances while all proteins remain unbound. Using this HPLC system with single quadrupole LCMS-2020 as the detector, the linear calibration range was determined to be 10–200 μg/mL with the recovery rate of 99%. 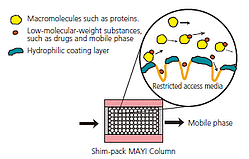 how the system enables untreated protein solution to be injected directly.